Being glazing contractors is both our passion and our livelihood. Every day, our employees in the field and in the office, arrive committed to doing top quality work and staying on-schedule. We're team players, because, the way we see it, building or renovating a building is a team sport. As challenges arise, you can count on us to problem-solve to keep your project on-track and on-schedule. That may mean that we get creative with scheduling, find alternative suppliers, pitch-in to do repair work, work nights, weekends, or extra hours - whatever it takes. Completing high-quality glass and glazing work is as important as completing your project on-time. Our glaziers, with their experience, skills, and passion, produce amazing work. Integral to their accomplishments, are our team leaders, project managers, and office teams who ensure that our glaziers have the right products, tools, and information to work their magic. Large or small, whether we're installing storefront windows or a one-of-a-kind glass wall, we are committed to delivering high quality work on every project. SGS Glass Co. Inc. was founded in 1993 by Scott Gordon Stevens. For a quarter century, the SGS Glass team of commercial glaziers is proud to have worked with general contractors and owners in greater Seattle and the Eastside to build and renovate commercial, multi-family residential, municipal, and other properties. 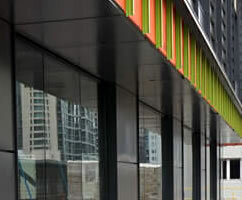 Contact us today to discuss your commercial glass or glazing project.